We are manufacturer and exporter of Rubber Fastener in India. We manufacture wide range of Rubber Fastener. 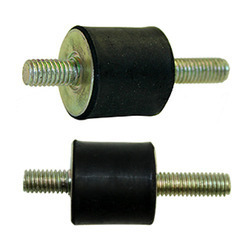 These Conveyor Belt Rubber Fasteners are provided with long years of service while requiring little maintenance. The design and structure of these conveyor belt fasteners is simple that makes it ideal to be used in various types of conveyors. These fasteners are made up of excellent quality materials that have provided with various features like durability, resistivity and non-abrasive. 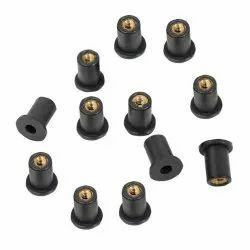 Flawless performance oriented Rubber Bonnet Fasteners we manufacture find high usage in automobile industry. Made from high grade raw material, each bonnet fasteners is tested for its durability, size accuracy, tensile strength, heat resistance and various other parameters before it is sent at customer's end. We offer a wide range of Fastener & Tool to our clients. These products are used using high quality of raw material. We offer these products at market leading prices to our clients. We Supply and Install Bucket Elevator Fasteners as per the requirement of the clients. 1. Grooved Rubber Sole Plate for 60 Kg & 52 Kg Rail [6 mm, 10 mm & 25 mm]. 2. 1: 12 & 1:8.5 Grooved Rubber Sole Plate for Point & Crossing and Turnout Set. 3. Grooved Rubber Sole Plate for Steel Channel Sleepers Fittings.